For some more spring motivacion for wisit our climbing courses in Teplice and Adršpach rocks we are uploading picture from first ascent on tower namen Sugar -rafinery chimeney. Picture is more than 15 years old and was made by friend Adam Praza. Thank you and we invite you to our climbing courses in Adršpach. Your school of climbing in Adršpach and Teplice rocks. Hallo Welcome spring and with it come new season of sandstone climbing with our climbing courses in Adršpach and climbing courses in Broumov area. So we welcome you to our climbingschool in Adršpach. Thank and best regards tomas. 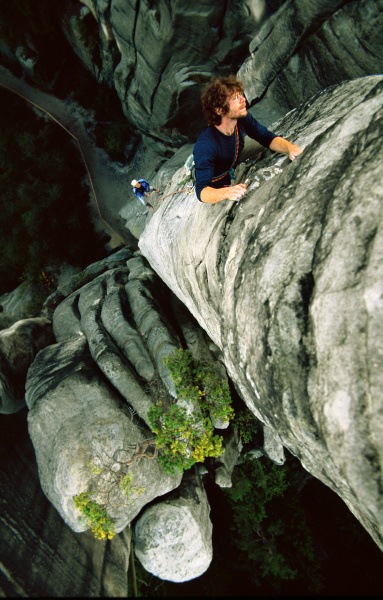 And for some inspiracion we load a picture of climbing on tower King. It is first climbed tower in Adršpach in 1923. Picture is not from the old original route. Today Climbing course in Adršpach we spend on nice quite rocks neer by castle Bischovstein. One of the costumers try a jump beetween tower. He realy liked this experience and he enjoy our climbing school in Adršpach. We have spent the first hot summer weekend in June on the climbing course in Adrspach and Broumov rocks, mainly by the northern walls of the sand-stone towers in Křížový Vrch. When searching for shade, we have found some less frequently climbed rocks such as “Rokoko” or “První” (“The First”). Both towers are among the highest ones in the area and they offer beautiful views of Adrspach rocks and the surroundings. With an advanced participant of the climbing course, we have climbed another impressive sand-stone tower: “Maják” (“The Lighthouse”). It is quite amazing to climb this rock tower in the evening, while watching the sunset over the most famous Czech mountains – Krkonoše. Welcome to the new year! The early sun is already warming up the rock walls in Teplice-Adrspach rocks, and so we begin the new season of the rock climbing courses in Adrspach and Broumov. There is an ideal place for the climbing courses in spring in the Broumov area: the impressive ‘mesa’ rock Hejšovina and Křížový Vrch. Hello from the rocks! Since the first of May, about one half of the climbing areas in Adrspach, Teplice and Broumov has been finally opened for climbing. Thus, we would like to invite you all to join our course of rock climbing in Teplice-Adrspach rocks. Of course, it is possible to climb even earlier in the smaller climbing areas such as Křížový Vrch, Ostaš or Hejšovina. With several participants of the climbing course, we have already done some climbing in that area and have celebrated the beginning of the new climbing season. Thanks, Tomas Climbing courses Teplice and Adršpach Hello! The fact that we have not added any news about the climbing courses in Adrspach and Broumov for some time does not mean that they did not take place. The reason is rather the occasional unavailability of internet in our new house in a little village of Bělý. We have organized courses in the well-known climbing areas of Adrspach and Broumov and have climbed the rock towers “Polední” (“The Noon”), “Růže” (“The Rose”), “Humambo” in Bischofstein or “Ovčák” (“The Shepherd”) and “Křeslo” (“The Throne”) in Křížový Vrch. All these rock towers are ideal for climbing coursesin Adrspach, as they are quite suitable for beginners and they offer breathtaking views. In the summer courses, we have also climbed some more difficult routes such as “Dlouhý Kout na Milence” (“The Long Nook to Lovers”), “Starou Cestou na Gilotinu” (“By the Old Route to Guillotine”), “Velikonoční na Tři Obry” (“The Easter Route to Three Giants”) and a very nice cleft “Amore” – all of them in Adrspach. In Teplice, with an experienced Canadian climber, we have climbed the rock tower “Lední Medvěd” (“The Polar Bear”) and the rock cleft “Muší spárou na Lahvičky” (“The Flies´Cleft”). Further, we have also visited the climbing area of Ostaš where we have climbed the rock “Sokol” (“The Falcon”). The course was held Friday, 8.10 rock climbing Adršpach - Teplice rocks. Two groups of daredevils climbed the rock tower Rose and Thorn Humambo. 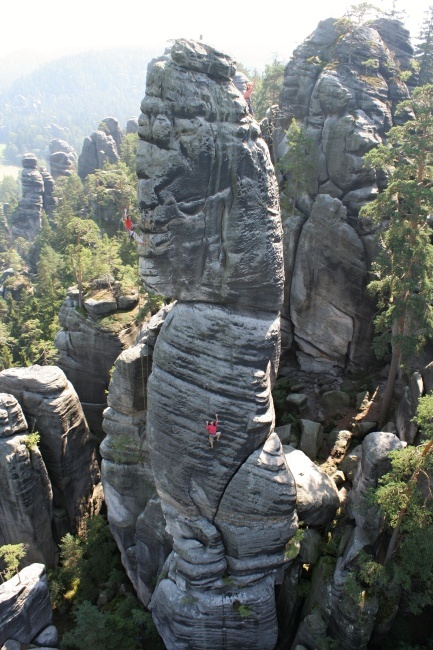 During the course of rock climbing in Adrspach tried except the climbing and rappelling and feeling on top of sandstone towers. New gallery was made today called slackline and some more movies down there..
It´s all about having fun! We are absolute beginners: mum, dad and a 12 years old boy with no climbing experience. Tomas showed us the way up to heaven. We spent two incredible days with him. We climbed 5 towers/rocks in Adrspach under his safe guidance and his endless patience. We never expected an adventure like that, a total experience for body and mind. Tomas was able to guide us to the peak as a great team. We practiced climbing in the chimney, crack, on the face, top rope and finally abseiling. Tomas really did open a new chapter in our lifes. We will be back and climb with him again for sure! He made us having the best time of our life, thanks Tomas! competence, knowledge, safety, and general personability. He's an incredibly strong climber. I don't know what his limit is, but it's far above ours, andhe had no trouble leading every pitch we climbed. He's been climbing in Adrspach for a very long time, and knows the place like it's his own backyard. Complicated, maze-like approaches and intricate routefinding were no trouble at all for him. He kept us quite safe the whole time, always making sure we were anchored even when we felt there was no need. He wasn't a jerk about safety, but he did make us feel as though it was foremost in his mind. Finally, he's just a spectacular person. Two days of hard climbing with people very far below his ability, and he didn't show a single moment of impatience or exasperation. He was consistently supportive and just a great person to spend time on the rock with. I have climbed with a few guides before, and I'd take Tomas over any of them any time. A great experience, which I will never forget--and Tomas was the one who made it all possible. Thanks Tomas! As a fairly new climber, I was slightly intimidated about the idea of climbing in Adrspach, even though my boyfriend had several years of experience. We hired Tomas after seeing him in "The Sharp End," and finding his contact info in our Lonely Planet guide. Feeling rather out of my element, what struck me most about Tomas was his demeanor. He immediately put me at ease; he clearly had a plan for us before we began, and his concern with my safety was genuine. I was also grateful for his patience. I climbed much more slowly than he and my boyfriend, yet despite the fact that he was often waiting barefoot in the hot summer sun--on multi-pitch climbs--I never once heard anything from him but sincere encouragement and helpful guidance. We had an amazing time climbing with Tomas for two incredible days, and truly, this pleasant, sweet person made it all the more an enjoyable and memorable experience. On weekend of 10and 11 of july climbing cours ocure in Adršpach. First day we climbed on 3 towers on Crosshill and et the end of the day we ascent tower King in Adršpach. Second day climbing course in Adršpach continuing with ascent of the hights tower called lowers. Ben and Enie from Los Angeles enjoyed it a lot..